Longarm Chris: Are you sitting comfortably? When I was in my early 20's I was knocked off my bike by a car. Since then I have struggled with a bad back. I try not to let it stop me doing the things I want to do, but there are some days that are more painful than others. Today is one such day. The thing that causes me the most pain is long periods of sitting. We had a snowy weekend so I spent 2 very happy days at my sewing machine piecing for myself - bad move! (literally!!!) I can hardly walk today. The reason I am telling you this is not for sympathy (although a little sympathy is always nice!) but to ask if any of you sewers use either a saddle stool or a kneeling stool whilst using your sewing machines. They are both supposed to be good for people with bad backs and sitting at a normal desk I can see how they could ease back pain but I'm not sure how they would work when you have to have one leg out in front to operate the foot pedal. I would be grateful if any of you have had experience of these stools, you would drop me a comment to let me know what you think. I'm not going to post a picture of me walking round holding a hot wheat bag to the base of my spine and lowering myself very gingerly on and off the sofa - good job you can't hear my grunts and groans too!!! Ha Ha.. At least I stand up to use the gammill so working is fine. Now for today's finished quilts. This is Kathy's quilt and she made it for her son (I think) and she wanted a triangle pattern so I used 'Triangle meander' in a pale grey thread. The fabric is so busy that it is hard to see the quilting on the front but you can see it better on the back. I stitched 'retro flowers' on it in a pale lavender thread. Not sure why my comment appears twice! Chris, I use a regular office chair when I piece at my DSM, but when I need to be in the one spot for extended periods of time at the longarm, I use a saddle stool. It does take a little adjusting to, but the relief and comfort is a definite bonus. 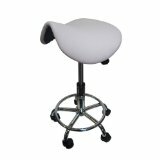 With arthritis in both hips, the saddle stool helps immensely in relieving discomfort. There are cheaper versions as well as dearer ones. The dearer being more ergonomically designed to maintain proper body alignment when sitting. 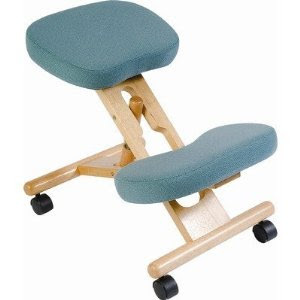 If you like the saddle stool style, just look for the ones marketed for dentists, architects etc. They are the ones designed for people that sit for extended length of time. Hope this helps. I have used the knee(ling) chair or praying chair as it's sometimes called here (in the Netherlands). It gave me pain on my shins, but for you it could be different. In the end Ibought a ball to sit on and brought it to work. It's great for your back, you automatically use the right muscles and (!!!) you move more: it's not a static sitting down but you are able to move more. Adk your fysiotherapist for advice. Know the feeling! But for me it is standing AND sitting g for long periods! Agony... A good g and t does the trick and lying on the settee!